The vice president's son Beau Biden, who is the Delaware attorney general, expects to return home Thursday from a Texas cancer center. DOVER, Del. — Delaware Attorney General Beau Biden, the eldest son of Vice President Joe Biden, underwent a medical procedure at a Texas cancer center on Tuesday and will be returning soon to his home state, the vice president’s office said Wednesday. His son’s medical situation prompted the elder Biden to cancel three appearances Thursday in Rhode Island and Maine, opting to stay in Houston with his son. The vice president was scheduled to travel Thursday to Rhode Island to attend a fundraiser for the Democratic National Committee and an event at Salve Regina University, and to Maine to headline a fundraiser for New Hampshire Gov. Maggie Hassan. The White House said Wednesday that Biden will not attend any of those events. “Vice President Biden is absolutely right to be with his son and family during this difficult time,” Hassan said. Biden is still scheduled to join President Barack Obama in Scranton, Pa., on Friday during the second day of Obama’s bus tour, said White House spokesman Josh Earnest. In a statement released by the White House, Vice President Biden and his wife, Jill, said Beau Biden underwent “a successful procedure,” but they did not provide any details. The White House declined to answer any questions about what procedure was performed, including whether it was diagnostic or therapeutic in nature. Beau Biden, 44, was hospitalized last week after becoming weak and disoriented while on a family vacation in Indiana. Biden was initially admitted to Northwestern Memorial Hospital in Chicago. He traveled the next day to the Philadelphia hospital where he had been treated for a minor stroke in 2010 to consult with his doctor. He spent last weekend at home in Wilmington before going to Houston, where he was admitted to the University of Texas MD Anderson Cancer Center this week. The Delaware Department of Justice released a statement saying the younger Biden had spoken Wednesday afternoon with his chief deputy and with the state prosecutor about several issues, including efforts to fight violent crime in Wilmington, and that he would speak with them again on Thursday after returning to Wilmington. It was not immediately clear when Biden would return to work. Authorities in Delaware confirmed that emergency responders were called to the vice president’s house, where Beau Biden has been living, two weeks ago. A county dispatch center log indicates that on Aug. 1, someone at the vice president’s home was reported to be possibly having a stroke and apparently not alert. 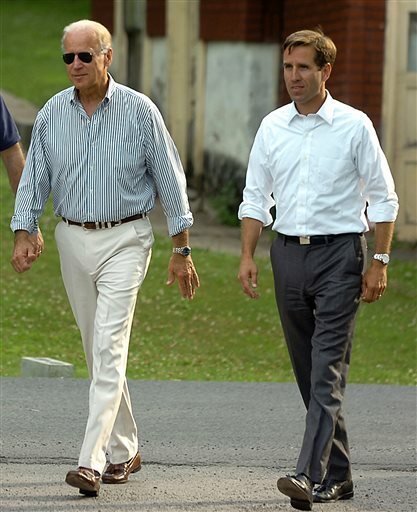 Beau Biden has been staying at his father’s Greenville home while his own house is renovated. The younger Biden has posted two photos of himself in recent days – one of him smiling with his father on Sunday, the other of him smiling with his wife, Hallie, on Tuesday. “Touched by all your well wishes – thank you. Nice evening in Houston w/ Hallie; will share update when we have it,” said the tweet accompanying the photo with his wife.